When Ruger first introduced the pocket-sized LCP (Lightweight Compact Pistol) a decade ago, it got a lot of attention from law enforcement and armed citizens because of its size, weight and ease of use. I managed to get one for a test and evaluation almost immediately after its introduction and found it to be surprisingly accurate and not so bad in the recoil department. It handled every .380 ACP round I fed into it, and I recall having hit targets out to 50 yards. I’ll be first to observe this is not a precision target pistol but a rugged little defensive sidearm. At the time, I was able to load up with an assortment of FMJ and JHP ammunition and recall some rather impressive muzzle flashes when shooting in low light. Thanks to advances in ammunition development over the years, the .380 ACP is no slouch as a defensive round these days. I even knocked together a deep cover holster for the test gun so I could carry it around. In observance of the pistol’s 10th anniversary, Ruger announced a Limited Edition anniversary model, and it’s pure eye candy for anybody looking for something distinctive to put in his or her holster. The LCP anniversary model is a two-tone entry with a 6+1 capacity. The slide is through-hardened stainless steel and the frame is the traditional glass-filled nylon with molded checkering on the sides and lower rear. According to Ruger, the skeletonized trigger is aluminum. There are front and rear cocking serrations on the slide. This pistol comes with a magazine floorplate extension allowing a finger rest, a feature I appreciated on the original test gun because it fit my hand a little better. The alloy steel barrel measures 2.75″ and has a blued finish. It is cut with six grooves on a 1:16″ right-hand twist. The pistol hits the scale at 9.6 oz. empty, so there is no question when it is fired: You’re going to know it, but actually the recoil is neither unmanageable nor uncomfortable. 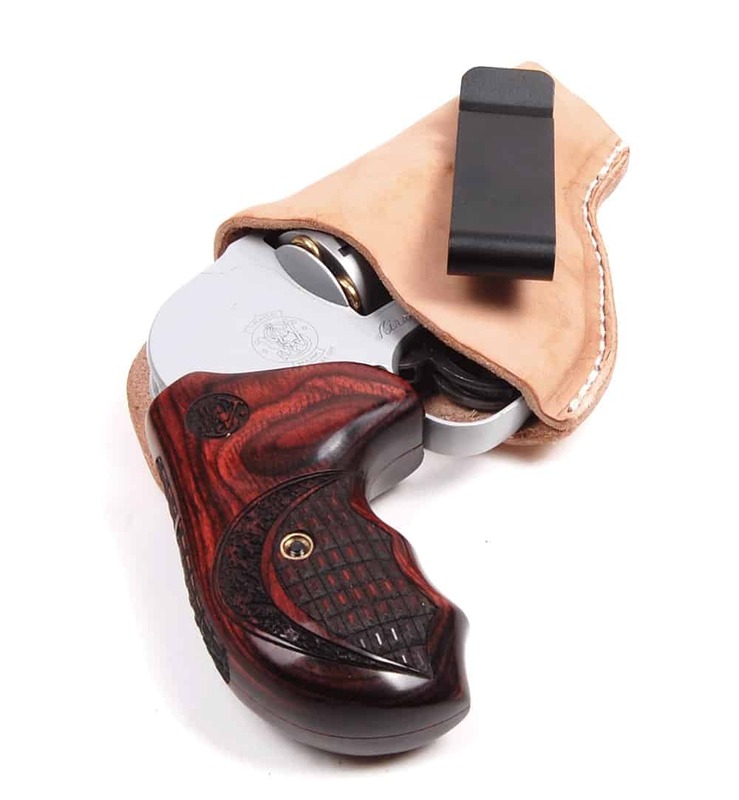 The hammer is recessed into the slide, so it will not snag if drawn from a pocket holster. It was one thing I highlighted in the initial review because in my region, it’s not unusual to see people wearing down vests much of the year, and this pistol slips quickly into the cargo pocket of a vest, even without a holster. At 5.16″ OAL, the 10th Anniversary LCP has fixed sights and comes with a single magazine. It will fit a variety of holsters and I know there are ankle rigs, deep cover “tuckable” models, traditional IWB rigs and even OWB belt holsters available from several different makers. It is laser engraved with a “Tenth Anniversary” emblem on top of the slide, and also with the dates 2008–2018. Ruger not only made this 10th anniversary model snazzy, it’s also very affordable with an MSRP of $299.